A prime specimen of Daily Hail -style confused double-unthink? The Diary of an ADI (approved driving instructor) just had two seconds of fame thanks to a post that is noteworthy only because it’s such a beautiful example of unthinking nonsense (and from someone who should know better). I was lucky enough to be taught to drive by someone with a sound attitude to other road users, which they just about managed to pass on to me (I didn’t like cyclists until I realised how much better it was for getting around, and “became” one). Who are cyclists in the UK? Unlike more enlightened countries where everyone gets about by bike, the road conditions we’ve created here predispose cyclists to fit into certain categories. Male, 25-49 for instance. More interestingly, Fiat amongst others push the statistic (which seems to have come from the DfT) that 83% of cyclists have a car (which shouldn’t surprise anyone – most cyclists are motorists like me who’re too smart or too sick of sitting in queues, and are leaving their car at home). That’s higher than the general figure – so cyclists are more likely to have a driving licence / car than your average member of the public. Apparently they are also “disproportionately likely to read broadsheet newspapers, be well educated, have a household income of at least £50,000 per year and shop at Waitrose” (Mintel 2010., via the Guardian). Anyway, the ADI’s post makes for an entertaining (perhaps depressing) example of silly thinking when you bear this reality in mind. For instance, the collision rate on our roads is apparently rising just because cyclists “have no road sense whatsoever”. But as almost all cyclists have been trained by an ADI just like this one, is it really possible he’s done such a bad job that his customers come out of the process not understanding enough about how the roads work even to ride a bike on them? Even if cyclists had exactly the same road sense as motorists, you’d expect a 50/50 split of liability in road collisions. Yet according to the police, they find “the driver solely responsible in about 60%-75% of all cases, and riders solely at fault 17%-25% of the time” *. That’s because, while the vast majority of cyclists have a driving licence anyway, only a tiny number of drivers have enough road sense (or common sense?) to understand how cycling on the roads works, and the patience, courtesy, and/or observation skills to share the road safely. Hence the need to build more cycling into the driving test procedure, because once you’ve spent a day or two on two wheels on the nation’s roads, you’ll never again wonder why people cycle the way they do (hint: it’s mainly because your fellow drivers are so awful, but you don’t understand that yet). Interestingly, they also say that cyclists disobeying signs or red lights was a potential factor in only 2% of collisions, with lack of lights only involved in 2.5% of collisions. , which fatally holes the ADI’s ranting about “the vast majority of cyclists” doing all sorts of illegal, inconvenient or discourteous things. The thinking really breaks down towards the end, when he adds a long addendum in response to incoming traffic from (I think?) CCE. Hillariously, he actually seems to think that “roads are primarily intended for motor vehicles. Being granted access to them does not make you more important than the roads’ primary users.” (This is so Daily Fail that I’m not sure it isn’t a cunning wind-up). Remember that 83% of these cyclists are drivers who’ve chosen not to be there in their car (and a good job too – otherwise congestion would be much, much worse than it is!). The ADI is telling 8/10 riders that, depending on how you chose to get to work any given Monday, you’re either doing great (in a car, own the road) or you’re the bane of society. Anyway, as right-thinking people in the UK know, there’s an enshrined right to travel by foot, horse, or bike on the roads, but you have to be licenced and restricted if you want to do it in a car. As an ADI, you’d obviously hope that he would impart this key information to everyone he teaches, so they can understand that when they are inconvenienced by someone with a right to use the roads, they should remember they’re only suffered to do so under licence – and that more than 8 out of 10 times, that guy on a bike is a guy who might be behind them in a motor tomorrow. No wonder drivers make so many terrible mistakes / road rage incidents if they aren’t getting even the basics from their numpty ADIs! All the more reason why cycling should definitely become a pre-requisite to holding a licence – and be taught by people, unlike this ADI, who display a sensible (and factually correct) understanding of our roads. * when you exclude kids who get mown down on residential streets – people like the ADI love to include them because under-10s really don’t have any road sense. Bizarrely in the UK, you’re not obliged to drive in a residential street in the careful expectation that it’s a living environment for the residents and their offspring, so almost every child on a bike you hit counts as a point “against” cycling – in Europe most of those collisions would be marked as the fault of the driver, who should have expected children to be in, or to enter the road outside their house without having as much road sense as an adult might. The more I think about the subject, the more I’m convinced that the problem is rooted in two separate areas. 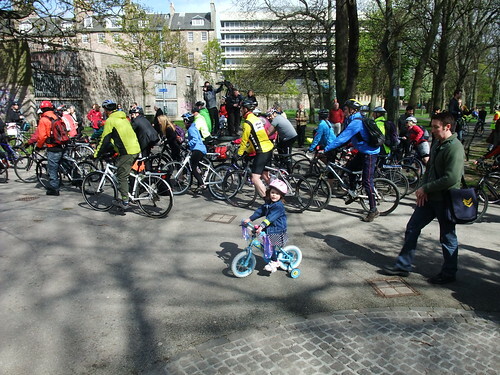 ‘Everyone’ walks or drives, which becomes the visual baseline for travelling; and since cycling is still not a majority mode of travel, people using bikes are noticed because they stand out from that baseline. As one learns in advanced driving – car or motorbike – the road users one remembers are the exceptions. The driver that races past at 110mph on the motorway, the biker that filters between lanes of 50mph traffic, the tour bus that tried to take a tight turn and blocked a whole junction for 15 minutes. The cyclist who blew a red light, swore at some pedestrians and went the wrong way up a one-way road. No-one remembers the hundreds of occurrences where the car, biker, cyclist and tour bus took turns to coincide with oneanother, interacting efficiently and without a fuss, making progress from A to B. So we have a situation where cyclists as a group are visible already, and at the same time a bunch of them don’t help their cause. Those are the ones people will remember, and it’s easy to apply those stereotypes more broadly, even though it might be only a small proportion of the group that is responsible for that stereotyping. Or is it more than that? The only surefire way to know is to observe out on the road, not by asking questions on a survey, and to build up a statistically robust dataset. Of course it can work the other way round, too. One bus company has a good track record on the road for driver behaviour; another bus company doesn’t. Is it every driver of the latter who has poor anticipation and poor tolerance of others, or a subset? Do all students walk all over the segregated shared use paths as though they was theirs alone, or just a small proportion of them—if not the same ones each time? Is every driver of a large silver Mercedes or white van to be afforded less approval? And perhaps more to the point, *why* did White Van Man become such a distinct subset of road users, and what is perpetuating it? Yet we all remember the drivers we see using mobile phones; again it’s a subset of all drivers, who by the same logic should be campaigning for tougher policing, tougher fines. We don’t hear our family, friends and colleagues telling us about those mobile phone drivers acting all dangerously in front of everyone else on the road. So coming back to the minority element, we’re only seeing half of the picture. If 4 out of 5 cyclists also own a vehicle, at least 4 out of 5 cyclists have also sat a driving test and have first-hand experience of both modes, but it could equally be 5 out of 5. However, assuming 5 out of 5 drivers have sat a driving test, we don’t know how many own a bicycle—or use a bicycle. It might be 4 out of 5, it might be 0.01 out of 5. The barriers to cycling in an everyday manner have been surveyed and researched to death, and while the everyday cyclist has designed his habits around one or more convenient factors of cycling, everyday drivers still predominate: for carrying people (but we have child seats, and tagalongs, and tandems! ), for carrying loads (we have big trailers! ), for going distances (we have trains, and velomobiles! ), for safety (we have our vulnerability, and ninja skillz! ), and for weather protection (we have, um, Goretex. And fleece.). And yet everyday driving predominates because it’s still considered easy and handy, and once paid for it’s apparently best to use it as much as possible. So cycling becomes pigeonholed as a minority activity that’s dangerous and inconvenient to everyone, and because it’s dangerous people don’t want to do it, so they don’t. 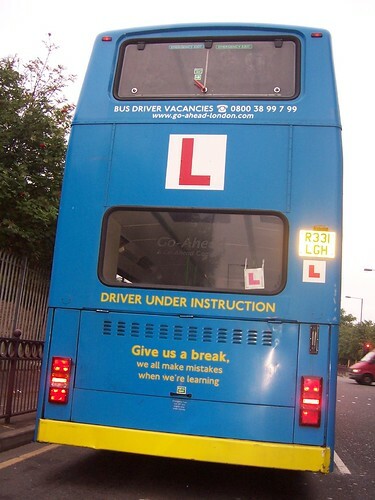 The baseline users are those who do it because they have to, or want to, and it’s a subset of those who then do it badly and stick in the minds of onlookers, including the majority of people who have done their driving test or cycling proficiency alike, and can use the road effectively. I saw a survey, which I’m sure was ctceunodd in Darlington, where a huge percentage of people were reported to consider cycling dangerous. I don’t remember the exact fugures, but it was around 90%.What shocked me was the something like 70% considered walking to be dangerous!Can we start a campaign to stop people parking on pavements? A BMW was parked right across the pavement on Stockton Road on Saturday, forcing my wife and I to manoeuvre our 3-year-old on her bike and our 1-year-old in her pushchair over the grass verge and around the back of the car. There are no parking restrictions on the side of Stockton road at that point, so the car could have been parked on the road. I fully agree with the previous comment from Somi. Cars that are parked on the kerb or even pathways should be deemed illegally parked and slapped with a fine. As a driving instructor in South Shields, I see this happening all the time where people park on the kerb due to vehicles parked on the opposite side reducing the width of the road, so idiots decide to try to make the road still passable by parking on the kerb. People are getting more and more selfish and down right “I don’t give a” about where they park regardless of danger or obstruction. Cycling is obviously is a more dangerous activity these days because of the higher volumes of traffic and more complex road situations.